Data-driven Diagnosis and Feature Extraction: In recent years a paradigm shift has been introduced in the way critical systems are maintained and operated in order to ensure their safety, availability and reliability. Focus is on technologies to monitor, process on-line real-time data, and detect and predict the remaining useful life of failing components or subsystems. The military and industrial sectors are recognizing the importance of such Condition-Based Maintenance (CBM) or Prognostic and Health Management (PHM) technologies, and they are actively pursuing their development and implementation. Techniques for the analysis of data acquired from operational systems, whether healthy or at fault, are crucial to developing these technologies. These techniques provide a sound approach to using historical information of such systems because they “learn” from past experiences in systems that have borne damage or undergone specific faults that can reappear, and thus be detected timely. Model-based Diagnosis and Prognosis: The model-based approach to engineering diagnostics and prognostics can be more robust than data-driven techniques in the sense that it can deal more easily with new or unforeseen situations, since the technique can incorporate and replicate, per its mathematical models, a wider range of behaviors, even if previously unobserved in actual systems. Because of this ability, model-based techniques can also dispense with the use of the extensive training and historical information that its data-driven counterpart requires. Vibration Signal De-Noising and Noise Modeling: Efficient data preprocessing is essential for early diagnosis of fault conditions and better prediction of Remaining Useful Lifetime. The goal here is to improve the signal-to-noise ratio through careful noise estimation and removal. A comprehensive scheme for dealing with the noise in a process consists of three main blocks; noise estimation, noise modeling, and noise characterization. A Particle Filtering Framework for Fault Detection and Identification (FDI): Our fault diagnosis procedure fuses and utilizes the information present in a feature vector (observations) with the objective of determining the operational condition (state) of a system and the causes for deviations from desired behavioral patterns. From a nonlinear Bayesian state estimation standpoint, this task may be accomplished by the use of a Particle Filter-based module built upon the nonlinear dynamic state model. A Particle Filtering Framework for Prognosis: The generation of long-term predictions of a fault indicator entails large-grain uncertainty. For that reason, we believe that accurate and precise prognosis of a failing component/subsystem must consider critical state variables as random variables with associated probability distributions. Particularly, our research focuses on estimating and predicting the evolution of a fault (or fault indicator) using an approach that combines information from both stochastic fault growth state models and on-line measurement data. Fault growth models are assumed to be nonlinear to accurately represent the underlying dynamics of the physical system, and also non-Gaussian to represent complex uncertainties and disturbances. A CPNN approach to Integrated Fault Diagnosis and Prognosis: Longer-term prediction is typically faced with growing uncertainties arising from various sources in the process as well as in the data collection methods. Diverse prognosis approaches exist in the literature based on whether the motivation is Bayesian learning, physics-of-failure modeling or purely data dependent constructs. The objective of this research is to improve upon current long-term prediction approaches by introducing an integrating architecture that quantizes and manages the aforementioned uncertainty and also allows an intelligent integration of multiple parallel prediction schemes resulting in better predictions with high degree of confidence. Neurotechnology and Cardiotechnology Research Activities: Research activities at ICSL in these areas are focused on the development of signal processing techniques aimed at detecting and predicting epileptic seizures and cardiac arrhythmias. 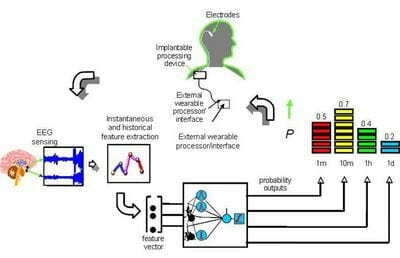 The enabling technologies include EEG signal pre-processing, feature extraction and seizure/arrhythmia classification via intelligent methodologies from the soft computing and systems theoretic areas. In collaboration with researchers from the University of Pennsylvania’s School of Medicine and NeuroPace, Inc., the research group has successfully developed breakthrough technologies for seizure detection and prediction. 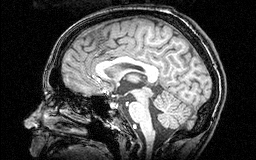 Current work is focusing also on neurostimulation, i.e. the development of modeling and control techniques in order to arrive at an optimum set of parameters for electrical brain stimulation that will stop seizures once they are detected or predicted. 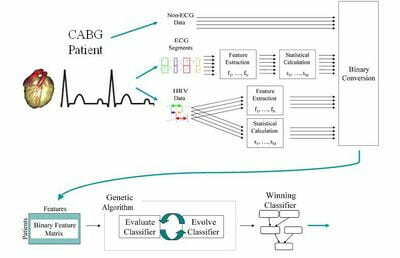 Atrial Fibrillation: The main focus of this research is the development of a risk stratification method to determine those patients at high risk through the development of electrocardiogram (ECG) features and classification methodologies using intelligent systems. Epileptic Focus Localization: The primary objective of this research to combine features of electroencephalography (EEG) and functional magnetic resonance imaging (fMRI) in order to better localize the source of epileptic activity in the brain. This information can then be used to facilitate surgical removal of the affected area in order to make the patient seizure free. Epileptic Oscillations: Literature suggests that interictal and preictal abnomral oscillations within the electroencephalogram (EEG) may aid neurologists in identifying dysfunctional brain tissue that is key to the generation of recurrent seizures in patients with epilepsy. This project investigates if a particular abnormal oscillation known as high frequency epileptiform oscillation may map an “epileptic network” in the brain. Neurostimulation: Seizure prevention research has focused thus far on EEG analysis tools to predict and detect an oncoming seizure. 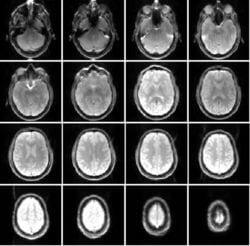 Stimulation to stop seizures has relied primarily on ad hoc methods and experience. This research activity employs modeling tools and modern control theoretic concepts to determine an optimum set of electrical stimulation parameters. 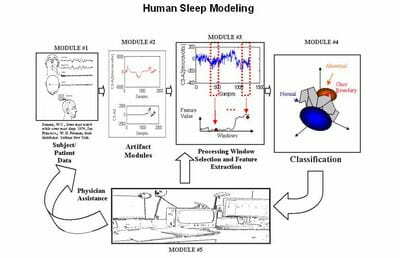 Sleep Analysis: Artifact removal and characterization of transitional periods within electroencephalogram recordings to aid in modeling normal sleep patterns to assist in clinical recognition of abnormal sleep patterns. 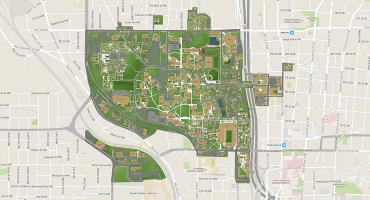 The University of Pennsylvania – Georgia Tech research has been funded by NIH, the American Epilepsy Society, NeuroPace, Inc., the Whitaker Foundation, the Charles Henry Dana Foundation, the CDC/GT collaborative research program seed grant and an Emory/GT research program seed grant. 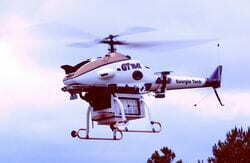 The Unmanned Aerial Vehicle (UAV) group develops algorithms that add to the autonomy of UAV systems such as the GTMax unmanned helicopter shown on the right. The group is currently studying tools for visual target tracking, adversarial reasoning, and automated see and avoid. The ICSL laboratory has been actively involved over the past fifteen years in research on Unmanned Aerial Vehicles (UAVs). This truly interdisciplinary activity is conducted in collaboration with fault and students from Aerospace Engineering and Computer Engineering/Computer Science. The research team is promoting innovative control and software technologies as applied to single and multiple UAVs. Missions envisioned for Micro Air Vehicles (MAVs), such as Intelligence, Surveillance and Reconnaissance (ISR) in urban environments, require exceptional agility. These missions typically involve flight through or in close proximity to buildings, tunnels and trees, and require the MAVs to maneuver using sharp dives and climbs along with small-radius turns. The small size of MAVs allows such flight operations within confined space but the control effectors must provide sufficient maneuverability with only limited sensing capability onboard the platform while maintaining stable operation. To meet these challenges, researchers have long been attracted by the amazing attributes of biological systems, such as birds and insects. Birds can fly in dense flocks, executing rapid maneuvers with g-loads far in excess of modern fighter aircraft, and yet never collide with each other, despite the absence of air traffic controllers. These and many other remarkable attributes of biological systems offer tantalizing opportunities to complement traditional engineering paradigms with emerging capabilities inspired by biological systems and processes. 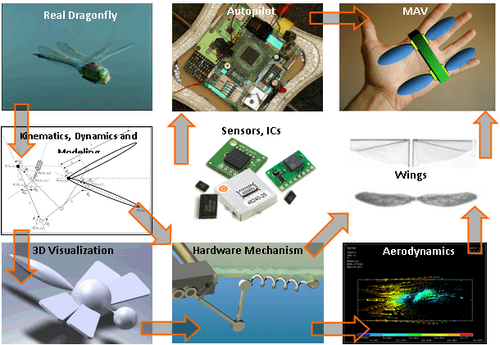 We are presently developing a novel framework for the design, modeling and control of a Micro Air Vehicle (MAV). The vehicle’s conceptual design is based on biologically-inspired principles and emulates a dragonfly (Odonata-Anisoptera). We are borrowing flight mechanism features from the dragonfly and merging them with indigenous designs in creating a novel version of a Flapping Wing MAV (FW-MAV). The MAV design incorporates a complex mechanical construction and a sophisticated multi-layered Hybrid & Linear / Non-Linear controller to achieve extended flight times and improved agility compared to other Fixed and Rotary Wing and other FW-MAV designs. The Micro-UAV features state of the art sensing and instrumentation payload, which includes integrated High-Power on-board Processors, 6DOF inertial sensors, 3DOF compasses, GPS, Embedded Camera and Long-Range Telemetry capability. A 3-layer control mechanism is being developed for controlling the dynamics and navigation of the MAV. The inner-layer is composed of a hybrid controller and two higher layers implementing a linear controller, which will be replaced eventually with a dynamic adaptive non-linear controller. The advantages of the proposed design compared to other similar ones include higher energy-efficiency and extended flight endurance. The design/modeling of the MAV and its kinematics & dynamics are tested under simulation to achieve desired performance. The potential applications for such a high endurance vehicle are numerous, including Air-deployable mass surveillance in cluster and swarm formations. The disposability of the vehicle would help in battle-field deployment as well, where such a MAV would be made available to soldiers for proximity sensing and threat level assessment. Other applications would include search and rescue operations and civilian law-enforcement. The efficacy of the design is demonstrated through a simulation/visualization environment. The dynamics are verified through simulations and a General Linear Controller coupled with a non-linear controller is shown to operate the vehicle. In accordance with specified objectives a prototype (a simplified version of a dragonfly) is being developed for flight-testing and demonstration purposes.